Ringing the closing bell, from left, are Eddie Northen, Sr. Vice President, CFO and Treasurer; Gary W. Rollins, Vice Chairman and CEO; R. Randall Rollins, Chairman of the Board of Directors; Henry B. Tippie, Lead Director; Betty Liu, Vice Chair of the NYSE; John Wilson, President and COO; and Beth Chandler, Corporate Secretary and Chief Legal Officer. PHOTO: ROLLINS INC.
Part of the Exhibition Hall setup on Aug. 10. PHOTO: ROLLINS INC. Replica of a WWII-era Orkin wagon. PHOTO: ROLLINS INC.
A replica of a WWII-era bicycle used by Orkin due to gasoline restrictions. 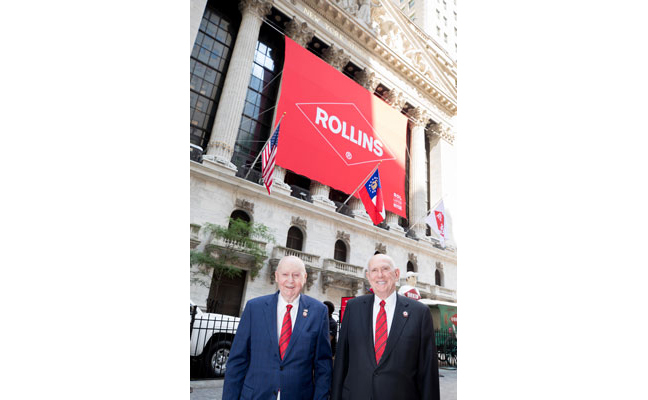 PHOTO: ROLLINS INC.
Henry Tippie, left, and R. Randall Rollins, stand in front of the NYSE Aug. 10. PHOTO: ROLLINS INC. Representatives at the initial listing of Rollins Inc. on the American Stock Exchange a few years before the company was listed on the NYSE. 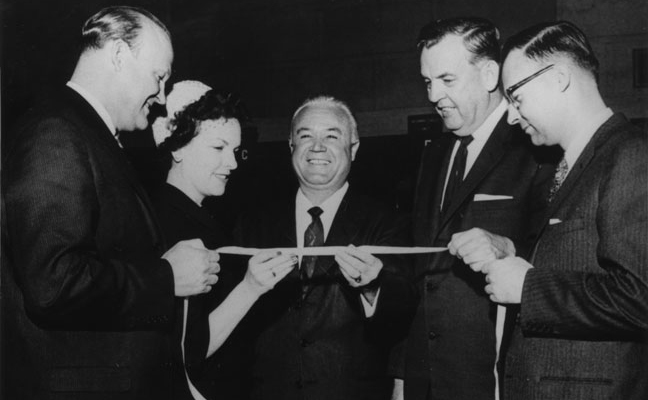 From left are John W. Rollins, Madalyn Copely, American Stock Exchange employee, O. Wayne Rollins, and Henry Tippie. 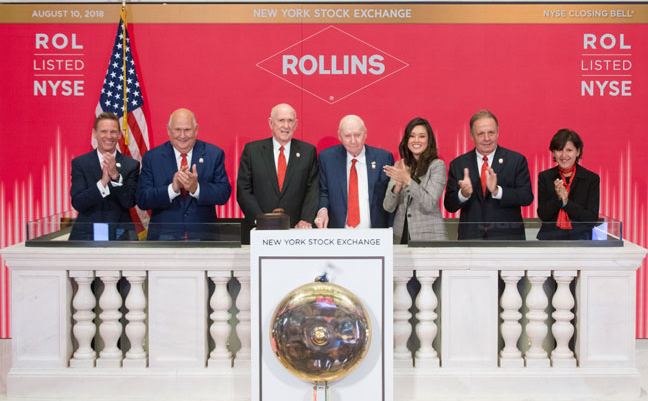 PHOTO: ROLLINS INC.
Atlanta, Ga.-based Rollins Inc. is celebrating its 50th anniversary of trading on the New York Stock Exchange (NYSE). To celebrate, R. Randall Rollins, Chairman of the Board, and Henry Tippie, lead director, participated in the closing bell ceremony Aug. 10. They share the distinction of being the only two directors present for a company’s initial listing and its 50th anniversary. The NYSE inducted the two men into the NYSE Hall of Innovation for their contributions to the pest control industry. 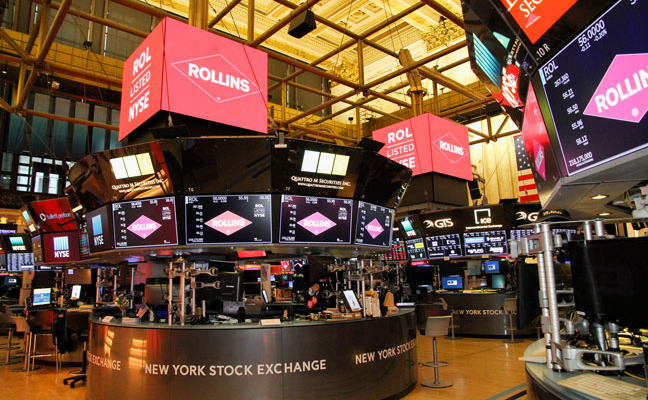 Rollins Inc. is the 204th longest listed company on the NYSE, and trades under ROL. To celebrate, the company hosted an Analyst Day and an exhibit in Experience Square, located outside the NYSE. The Analyst Day provided NYSE analysts and top investors with the opportunity to meet with Rollins, Tippie and other executive leaders, including Gary W. Rollins, Vice Chairman and CEO, and a 2012 PMP Hall of Famer; John Wilson, President and COO; Eddie Northen, Sr. Vice President, CFO and Treasurer; Elizabeth Chandler, Corporate Secretary and Chief Legal Officer; Tom Luczynski, President of Orkin Global Development and International Franchising; and Julie Bimmerman, Vice President of Finance and Investor Relations. 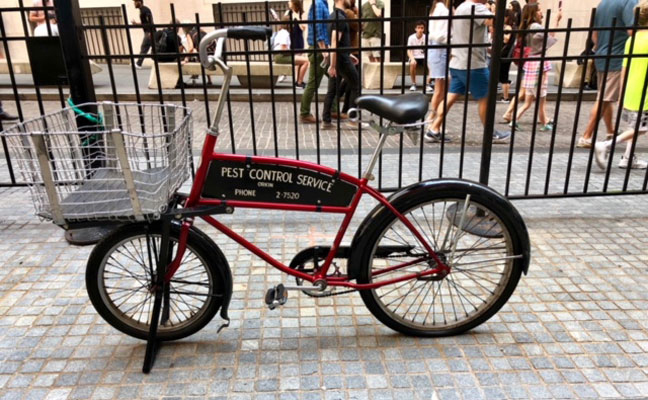 The exhibit featured a replica of a World War II-era Orkin wagon and a replica of a bicycle used for transportation during the war due to gasoline regulations. The event also highlighted several technologies and other Rollins brands to tell the company’s story. In 1964, Rollins Inc. acquired Orkin for $62.4 million, with reported sales of $37 million. In fiscal 1969, Rollins reported revenues of $106.3 million. At the end of fiscal 2017, the company reported revenues of $1.7 billion. 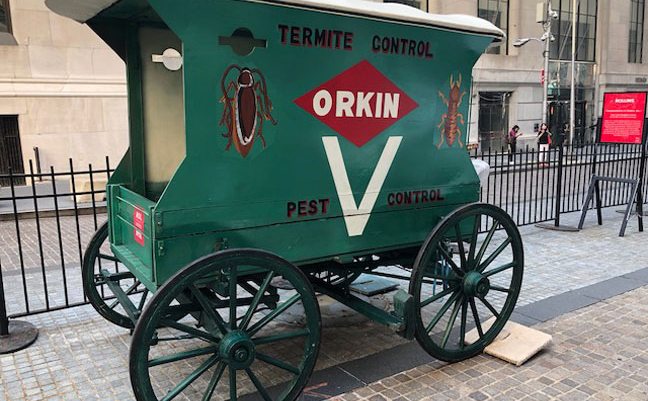 In 1995, Orkin established its domestic franchise program, and in 2000, Orkin launched its first international franchise. Today, Orkin has 84 international franchises represented in 55 countries. In 1999, Orkin acquired one of Canada’s leading pest control companies, PCO Services, now Orkin Canada. Since that time, Rollins Inc. has become the parent of 18 pest control brands, providing termite and pest control services to commercial and residential customers worldwide. In 2001, Rollins Inc. established the Rollins Learning Center, a multi-million dollar, hands-on training facility in Atlanta, Ga. Its state-of-the-art interactive distance learning system reaches employees worldwide. In 2017, Training magazine recognized Rollins, Inc. for the 12th time for the quality, commitment and investment in training its employees. For the past 20 consecutive years, Rollins Inc. has enjoyed increasing revenues and profits, and for the last 16 years, its board of directors has approved yearly dividend increases by a minimum of 12 percent. Additionally, Rollins Inc. has declared a special dividend for the past six years.